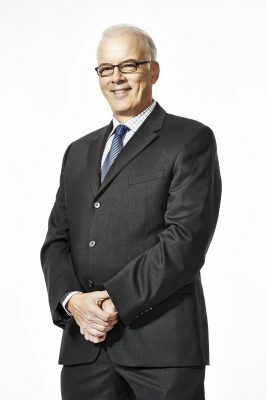 Scott Oake was a pre-med student at Memorial University of Newfoundland, when he volunteered at the campus radio station. Broadcasting quickly became his passion, and he decided to pursue a career in the radio and television field. After working part-time at CBC St. John's, he was hired full-time by the network in 1974. Relocating to Winnipeg, Oake became the sports anchor on CBWT's 24Hours from 1979 till 1989. From there, Oake was hired by Hockey Night in Canada, where he is probably best known as a regular contributor and host on broadcasting NHL games to a national audience. Since the 2003-04 season, he has hosted the second game of HNIC's Saturday night double-headers. In addition to his CBC work, he joined the Sportsnet's national NHL coverage in June 2014. Along with his Hockey Night role, he also serves as ice level reporter for Sportsnet's Wednesday night games. In addition to hockey, Scott has covered high-profile sporting events including the Olympics, Commonwealth Games, CFL football, among many other sports. In 2003, Oake's interview with NHLer Brett Hull won him a Gemini Award for Best Host/Interviewer in a Sports Program/Sportscast. In 2004, he hosted the hockey docu-drama Making the Cut.